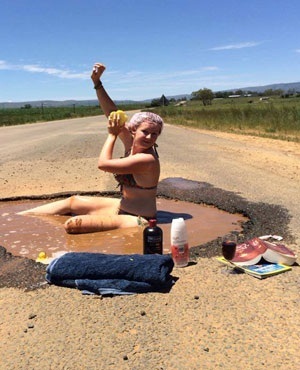 Social media in South Africa was abuzz following the story about a woman who decided to prove a point and take a bath in one of the potholes last week. The two women posted the photos on Facebook and encouraged people to spread the message that government had to fix potholes that threatened the lives of tourists and locals. “This specific road, the R36 between Machadodorp and Mashishing, has been unusable for years now and it’s mainly because there are 40-ton trucks that make use of the road every day due to a lack of railway structure. It is the responsibility of government to fix this road,” said Botha. Botha said she used to take guests out on horse trails, but the road had become so damaged that neither her horses nor vehicles could use it. “It’s simply too dangerous,” said Botha. Not long ago, President Zuma of South Africa was in the media after making a joke about Malawian roads claiming they were substandard. surely, there is no enough space for one to take a bath in them.